On Saturday evening, former Mayor Bob Lanier passed away. He was 89. 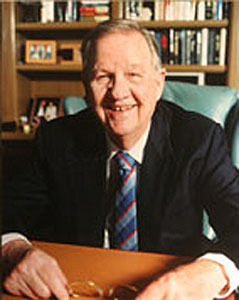 In his lengthy career of public service, Lanier served as the Chairman of the Texas Highway Commission, Chairman of METRO and the Mayor of Houston for three terms from 1992 to 1998. Born to humble beginnings, the brilliant Lanier earned a degree from the prestigious University of Texas Law School and went into private practice in Houston. Soon thereafter, he shifted his sights to real estate and development, and amassed a small fortune. But Lanier’s central priority was never to earn money, and he made a point of shifting toward public service later in his career. Serving on both the Highway Commission and at the helm of METRO, Lanier tirelessly worked to improve traffic and congestion around town. Perhaps most notably, Lanier butted heads with the mayor at the time, Kathy Whitmire, over an ambitious and pricey proposal to build a massive monorail system throughout Houston. Lanier decried the idea as a naive boondoggle, and — among other reasons — used it as an impetus to run for mayor and win. One of his first goals was nixing the monorail proposal; a decision that is still divisive within Houston political circles. Over the next six years, Lanier worked hand-in-hand with business leaders and political establishment figures. He did a lot to improve traffic, namely by investing more into roads. He also increased the number of police officers in the city, a driving factor in a huge plunge in the crime rate (which was also attributed to a nationwide trend). But, Lanier — always a card-carrying Democrat — also accomplished many progressive goals. He dedicated the bulk of his last term in office to saving/expanding affirmative action in Houston, namely reserving a share of city contracts to minority & women owned businesses. In a time when the national sentiment moved against the use of racial preferences in places as liberal as California, Houston bucked the trend in 1997 when they approved Lanier’s affirmative action program. The New York Times ran a headline on the topic, because of just how unexpected the voter support was. Lanier fastidiously worked to accrue corporate backing for affirmative action, and touted the program as a way to ensure diversity within Houston. Lanier was also an important union backer, insisting upon their inclusion in big public sector developments such as the downtown Hilton Hotel at the convention center. Perhaps most importantly, Lanier worked to ensure diversity in this city within politics as well as business. He appointed both Ben Hall and Gene Locke as City Attorney, propelling both men’s political careers, and he was also invaluable in electing Lee Brown, the first African-American Mayor, as his successor. I only met Lanier a few times in passing, but I am close with few people who knew him very well. What they all told me was that the casual, cheerful, “grandfatherly” demeanor he emitted in public did not change one bit behind closed doors. Even ideological opponents of Lanier conceded that he was a righteous man who tried his hardest to do what he thought was right for this city. Lanier was the mayor when I was born and, unlike any succeeding mayors, I do not personally remember any of his term. But what I’ve read and what I’ve been told suggest, better than I could ever recall, that he was a truly inimitable figure within local politics. Among others reasons, Lanier’s endorsement of Locke was one of the reasons my family supported him in 2009, the first mayoral election I intently followed. Houston has truly lost a giant. My deepest sympathies and condolences are extended to his widow, Elyse Lanier, as well as his other family. This past week was the 50th anniversary of integration at my hometown’s college, the University of Houston. The college has seen a dramatic transition and is now the third most racially and ethnically diverse college in the nation, according to the U.S. News and World Report. This reversal is most likely the result of both changing demographics and affirmative action. On the other hand, the diversity at the University of Texas is less likely to be attributed just to changing demographics: Since integration, the proportion of African-American students has risen to 20 percent, and the proportion of Latino students has risen to nearly 21 percent. This blossoming of diversity is newly found in the South, finally taking part in the progressive tenants of the 20th century. However, these programs now face new challenges from our judicial system. Tomorrow, the Supreme Court will hear oral arguments in the case of Fisher v. University of Texas, in what will, most likely, be a landmark Supreme Court decision. It could outlaw all affirmative action programs used at public universities. The Supreme Court is likely to strike down all affirmative action programs, as Justice Sandra Day O’Connor, the swing vote who saved the programs 10 years ago, is no longer on the court. There is no doubt in my mind that affirmative action has tremendously changed this country for the better. In my “Social and Political Philosophy: Democracy and Disobedience” course, Prof.Andreas Teuber (PHIL) mentioned that President Johnson once stated that affirmative action was necessary because students overcoming poverty and racism could not be accurately measured against those who did not have to face the same difficulties. Indeed, the harshest critics of affirmative action today, in their blind hatred of anyone given the slightest push in college admissions, underscore why affirmative action is needed in the first place. All too often, those who oppose affirmative action lay out the same story: The sad rich white kid was denied entrance into a prestigious university, as he may feel is his birthright. Each of the plaintiffs of affirmative action court cases have sued institutions of higher learning after they were denied admission. These people assumed that the sole reason for their rejection was because they were white. Additionally, most detractors seem to fundamentally misunderstand how affirmative action programs function today. While originally, universities may have had quota systems, these actions have been illegal for 34 years since the Supreme Court case of Regents of the University of California v. Bakke. Under current precedents and universities’ rules, race may only be considered a part of the larger picture in admissions decisions. In reality, several other factors are considered during the college admissions process aside from grade point average, leadership and extracurricular positions. Personality (that is one of the reasons there is often an interview), background and profile are some of the additional factors. Affirmative action’s opponents may not understand that wealth, familial connections and a stable home life have tremendous influence on a student’s grades throughout high school. In 2010, Harvard University published an article alleging that the SAT was biased toward white people, citing cultural differences in the verbal section. Additionally, a 2009 study published by The New York Times showed an average difference in score of about 375 points between the lowest and highest income groups, most likely as a result of the ability to purchase preparation materials and tutoring. Mayor Julián Castro of San Antonio, who delivered the keynote address at the Democratic National Convention, is another example of the positive attributes of affirmative action. While Castro had always stood out among his friends and family for being intelligent, he could not overcome the institutional bias of standardized testing. According to a New York Times article from a few years ago, Mayor Castro’s SAT score was 1210 out of a maximum of 1600, well below the mean score for Stanford University. He attributed his acceptance to Stanford to its affirmative action program. Granted, Castro boasted a stellar grade point average, but affirmative action was most likely at least partially responsible for his acceptance. It is worth noting that without any further help, he excelled at Stanford, was elected to the university’s student senate, and gained admission to Harvard Law School, this time in the median range of incoming students. Such hatred underscores why the program is still needed today, just as it has been needed in the past. I am sure there are many more like Castro whose stories have yet to be written. If our nation’s Supreme Court justices overturn the 30 years of precedent to outlaw affirmative action in public institutions, their stories may never be written. Ernest McGowen, Sr., the second African-American elected to the Houston City Council and the father of the city’s Affirmative Action program, died at the age of 87 on Sunday. McGowen was the first Councilmember for the northern District B, being first elected in 1980 after a successful lawsuit brought single member districts to Houston (something our Austinite friends are still fighting for) and stayed until term limits forced him out in 1994. He was a major advocate during the Whitmire Administration for increased affirmative action programs. Among his accomplishments were being the sponsor of the MWBE program (minority and woman-owned business enterprise), writing the ordinance prohibiting support of apartheid South Africa, supporting striking Sanitation Workers, and helping to establish MLK day as a city holiday. Former City Councilmember Anthony Hall, State Senator Rodney Ellis, and U.S. Representative Sheila Jackson Lee, who all served with McGowen on the Council, commended McGowen’s record and lauded his memory. RIP Councilmember. I was always remember him as a pioneer, a hero, and a fighter always for what is right. The Houston Chronicle has the full story.